With an extensive selection of new and used vehicles, Chapman Automotive boasts a vehicle for everyone at a price — and color — that fits any budget. Customer Bobbie Nemetz, who recently purchased a 2015 pink and black Jeep Sahara Wrangler, is a testament. COURTESY Bobbie Nemetz and Chapman Warm Springs general manager, Lawrence Ennis, stand in front of her pink and black Jeep Wrangler at the Chapman Chrysler Jeep location at the Valley Automall. An avid pink lover, Nemetz previously owned a bubblegum pink Volkswagen bug. She’s also a Jeep lover, though never having owned one herself, she vividly remembers playing in the backyard of a friend’s house in a Willys Jeep with no top when she was a young child. From the age of 10, Nemetz vowed she would one day be a Jeep owner. The years went on and Nemetz purchased a used Ford Edge from the Chapman Value Center on Warm Springs Road. Months later, while having her car serviced, Nemetz saw a pink Jeep Wrangler at the Chapman Chrysler Jeep location. Having just purchased her car, she knew the timing wasn’t right. 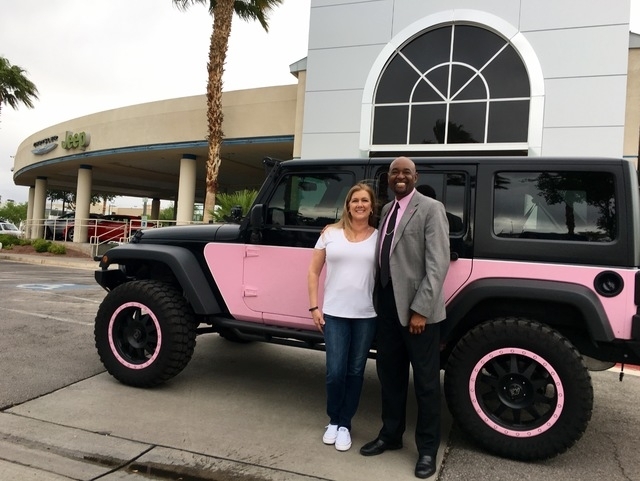 Three years later while at the Chapman Warm Springs location car shopping with her daughter, Nemetz saw a pink and black Jeep Sahara Wrangler and this time knew she had to make the vehicle hers. She took several images of the Jeep and shared them with her children and, after consideration, decided the time was right to do something for herself. Two days later, she purchased the 2015 Jeep Sahara Wrangler. Nemetz says the Jeep often makes her think of her two dear friends who have had bouts with breast cancer. It also reminds her of the story Lawrence Ennis, general manager of the Chapman Warm Springs location, shared about losing his mother to the disease. As great supporters of breast cancer research, the Chapman Automotive team participated in the annual Susan G. Komen Race for the Cure event in downtown Las Vegas this month. Chapman Dodge Chrysler Jeep Ram, at 3175 E. Sahara Ave., sells and services new and used vehicles. For more information, call 702-457-1061 or visit vegasdcj.com. Chapman Chrysler Jeep sells and services the complete line of Chrysler and Jeep vehicles from its location at Valley Automall in Henderson. The dealership is located at 930 Auto Show Drive and can be reached at 888-207-1687 or online at chapmanchryslerjeep.com. Chapman Value Center, 3470 Boulder Highway, sells and services new and used vehicles. The dealership can be reached at 888-299-0170 and at chapmanvaluecenter.com. Chapman Warm Springs, 1100 W. Warm Springs Road, sells and services vehicles chosen from Chapman’s 26 Southwest locations. Ennis can be reached at 702-338-5900 or at lawrenceennis.com. All dealerships are open for sales from 8 a.m. to 9 p.m. Monday through Saturday. Parts and service are open from 7 a.m. to 6 p.m. Monday through Friday and 8 a.m. to 2 p.m. Saturday.